Making your own corned beef or salt beef is so easy, it’s fascinating how something so simple as soaking a piece of beef in brine can completely transform it. Curing your own corned beef is something you really should try, it is a firm favourite in my house year round. 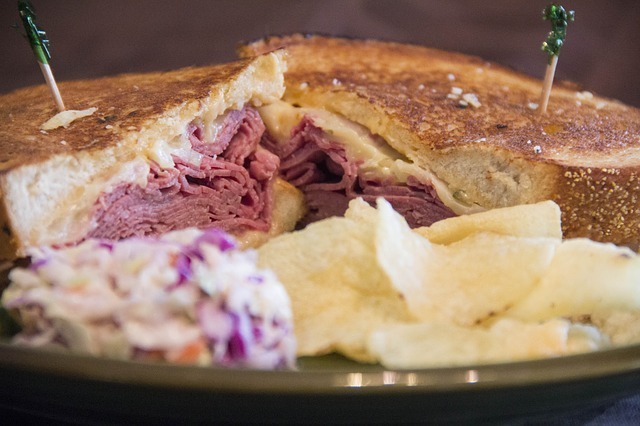 Depending on where you live you might not know what corned beef actually is. In the UK people know corned beef as a highly processed tinned beef in gelatin which is in America is known as “Bully Beef”. Corned beef is more simply a salted beef. It can be made with many cuts of beef but usually lean joints with not much fat, if you have ever tried corned beef before it is usually brisket. If you make it yourself, of course, you can choose whatever cut you like, upper or lower round, brisket or silverside. The key thing with any cut you use though is that you want it to be fairly lean. The “corned” in corned beef comes from the type of salt that would have traditionally been used. Historically the word “corned” referred to granules, so in the case of corned beef it refers to granules of salt that is used to preserve the beef. The beef is soaked in a salt and sugar solution along with some nitrates with spices and flavourings. The meat is left in the brine to cure for a period of 5 – 7 days in the refrigerator. The brine penetrates right through to the centre of the meat, this process is the curing. The corned beef is then removed from the brine and rinsed under cold running water. The beef is then transferred to a pot and heated to a boil. The corned beef is simmered until tender, depending on the size of the brisket or joint this usually takes around 3 hours. The cure is really the transformative process of turning a regular cut of beef into something quite different, in terms of flavour and also the texture, and colour. To cure our beef, whether it is brisket or another cut we use a basic salt brine along with sodium nitrite in the form of Prague Powder #1. The sodium nitrite in this corned beef has a couple of roles. It is not strictly necessary to make corned beef but I prefer mine with this small addition. It is a preservative. Along with the salt in the brine, Prague powder #1 is a powerful preservative. We will be curing the brisket in the fridge so the preservative effects aren’t imperative in our case. It retains the colour of the beef. 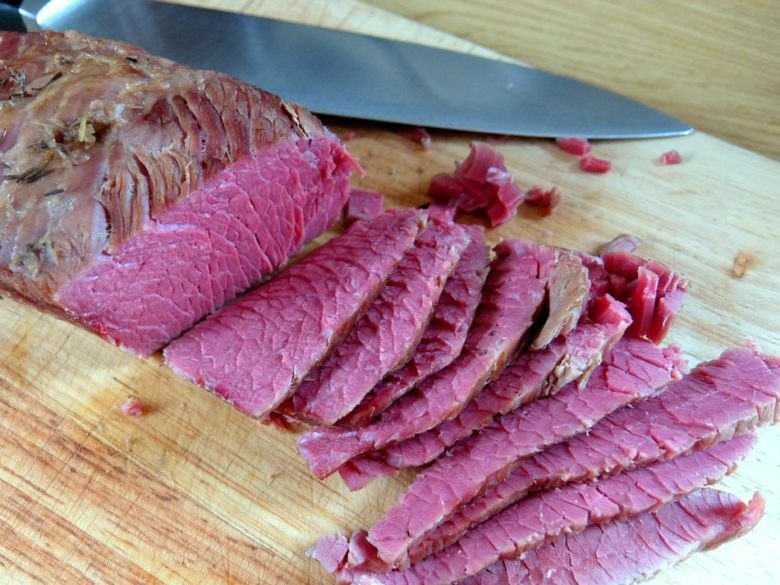 If you have ever seen corned beef you may have noticed the vivid red colour. Without the Prague powder #1 the meat will lose the red colour and go a less appealing grey. As we are boiling the corned beef we won’t have any browning either. Add a distinct flavour. The sodium nitrite that is in Prague powder lends a distinct flavour that you find in almost all cured meats. An ordinary brine will alter the flavour somewhat but sodium nitrite does lend a little more of that savoury character synonymous with cured meats. To find out more about the use of nitrites please read this guide. 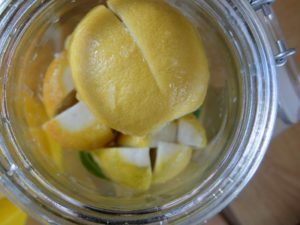 Brines are perfect for turning tough cuts into tender, succulent pieces of meat. 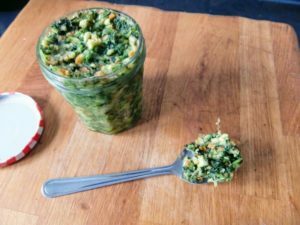 Traditionally brines would have been used to help preserve the meat. A saline solution has anti-bacterial qualities, our early ancestors would have known that raw meat stored in brine would take longer to spoil than meat without any storage consideration. It should be noted that, nowadays, we know there are some bacteria that can still survive in highly salty solutions, it is just a much harder environment for them. This is why we will brine the meat in the fridge to prevent any microbial growth. Sugar is also added to this corned beef recipes brine which provides additional flavour as the cure works. Makes the meat moister. The brine is absorbed into the meat and after cooking it loses less moisture meaning the corned beef will be much juicier. Proteins are denatured. Meat proteins are tightly ravelled and as the meat is brined they are unfolded and unravelled. This process makes the brisket more tender once cooked and moister as water can move into the muscle fibres. Seasons the beef all the way through. As the brine is absorbed the salt is drawn through right through to the centre of the meat. This is a good opportunity to add flavour to the brine which will also be drawn into the meat. Brine for curing meat like corned beef requires a salt concentration of between 5 – 8% by weight. This is easy enough to work out if you weigh both the water and the salt. When we cook the corned beef some of this salt will be drawn out of the meat into the cooking water so the end result won’t end up tasting to salty. Begin by preparing the brine, it is best to do this the day before you make the corned beef so you can chill it to fridge temperatures. Take 2 litres of the water and in a pan combine it with the salt, prague powder #1, sugar, pickling spice, bay leaves and garlic. Heat and stir to dissolve the salt and bring to a simmer. Once all the salt and sugar has dissolved remove from the heat and add 1 litres of cool water to bring the temperature down. Let the brine cool and put in the fridge to chill, I usually leave it, covered, in the fridge overnight. Trim the brisket or whatever cut of beef you have chosen. Remove most of the fat from the outside and any sinew. Place the beef in a non- reactive container such as plastic or glass that will hold the meat as well as all 3 litres of brine. 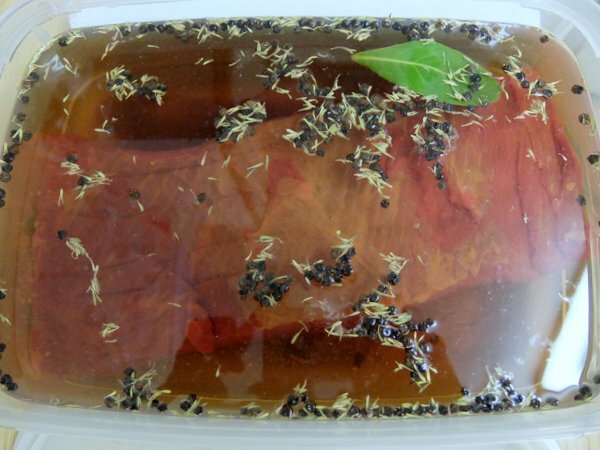 Cover the beef with the cold brine and make sure it is fully submerged. Cover and place in the fridge. 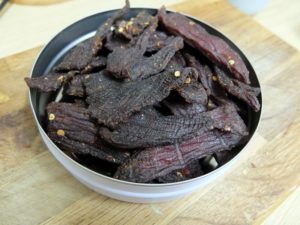 Leave the beef in the fridge for 7 days. Make sure the meat is submerged and give the brine a stir once a day to ensure the brine has an even concentration of both salt and flavourings. During these 7 days the salt will slowly work it way to the center of the meat. After 7 days remove the corned beef from the refrigerator and give it a rinse under cool running water, discard the brine. Place in a pot and submerge in water, bring to the boil and simmer. You may wish to add a few vegetables and herbs to flavour the cooking stock such as carrots, celery and onions. Boil for around 3 hours until the meat is nice and tender. Take the corned beef out of the pot and when serving slice across the grain of the meat for the most tender slices. Corned beef is perfect either hot or cold and great in sandwiches with sauerkraut and mustard.